As they did with the recent Adventures of Baron Munchausen DVD, Amazon are offering visitors the opportunity to vote on which sleeve design the next Hammer DVD set, Icons of Horror: Hammer Films, will use. Titan Books has acquired the UK and Irish rights to publish a graphic novel based on Blizzard Entertainment's World of Warcraft. Since its debut in 2004, Blizzard Entertainment’s World of Warcraft has grown to become the world’s largest massively multiplayer online role-playing game, with more than ten million subscribers. Its first expansion pack, The Burning Crusade, holds the record as the fastest-selling PC game of all time, with nearly 2.4 million copies sold in its first twenty-four hours of release. 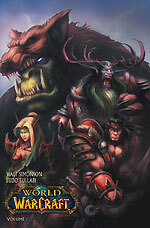 Set in a fantasy world split into two factions – the Alliance and the Horde – where humans exist alongside shamanistic orcs, mystical elves and bovine-headed tauren, World of Warcraft lets players undertake quests and challenges, explore richly imagined environments, and battle deadly monsters. Written by highly regarded comics creator and master fantasist Walt Simonson (Elric, Orion) with art by red-hot newcomer Ludo Lullabi, World of Warcraft will be published by Titan on 26 September 2008 as a stylish and collectable hardcover volume, priced £16.99. The story follows the plight of a human who is found unconscious, washed up on the shores of Kalimdor, with no memory of who he is or how he arrived there. Enslaved by the orc shaman Rehgar Earthfury, this man must fight for survival against members of both the Alliance and the Horde, striking uneasy relationships with other races in his quest to find the secrets of his past. Filled with monsters, characters and locations drawn from the game, this new volume from Titan is set to be a must-have item for the UK and Ireland’s masses of World of Warcraft players. Amazon has the book available for pre-order for £11.21 here. Titan will also be publishing the official tie-ins to the next chapter of the Star Wars saga, Star Wars - The Force Unleashed. 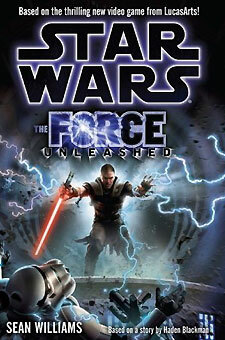 The Star Wars Saga continues this summer in Star Wars: The Force Unleashed. Set between Episode III: Revenge of the Sith and Episode IV: A New Hope, The Force Unleashed delves into the previously unexplored period with Darth Vader at the height of his power. 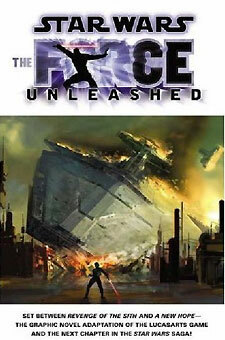 This next-generation videogame from LucasArts, will be launched on 19 September 2008 with a multi-million pound promotional budget, but Titan Books is bringing fans the full story of the ‘Dark Times’ weeks in advance, with the publication of Star Wars: The Force Unleashed the official novelisation and the graphic novel adaptation on 22 August 2008! This gripping action-adventure finds the Jedi order crushed under the devious hand of Emperor Palpatine and a new order risen, one that seeks to dominate the galaxy using the iron fist of Darth Vader. But Vader cannot control an entire galaxy alone and has selected his own apprentice from among those gifted with Force-sensitive abilities. As the fate of the galaxy hangs in the balance, this new apprentice must choose their own destiny. The hardcover official fiction novelisation [£17.99, 9781845767563, 336pp] is written by New York Times-bestselling author Sean Williams, co-author of three previous books in the Star Wars: New Jedi Order series and winner of multiple Ditmar and Aurealis Awards. The graphic novel adaptation [£12.99, 9781845767006, 128pp] comes from LucasArts games writer turned comics writer, Haden Blackman. Developed under direction from George Lucas, Star Wars: The Force Unleashed promises to completely re-imagine the scope and scale of the Force by taking full advantage of newly developed technologies that will be seen and experienced for the first time. With a new range of toys from Hasbro to support the game and the books is set to be the biggest Star Wars event since the release of Revenge of the Sith in 2005. Amazon has the novel available for pre-order for £8.99 here, and the graphic novel available for pre-order for £6.49 here.